INCA was approached by the engineers at CSX Transportation to create a replacement for the out-dated and problematic technology being used in the manufacture of their 'coil car', a specialty rail car designed to transport coils of steel. Historically, this 'coil car' was insulated by spray in place (SIP) urethane foam. While this foam was thermally adequate, it came with some serious negatives that the railroad wanted to avoid. Specifically, foam was expensive to install, fragile in service, flammable, difficult to repair and heavy. Also, there are potential health issues during installation of foam. Instead of foam, INCA suggested the most durable Thin Film Thermal Management Solution in our catalog: CH-202. INCA CH-202 reversed the negatives of foam use by being inexpensive to install, extremely durable, easily repaired and weighing very little. CH-202 has a water-based vehicle and offers no health hazard during application. Also, CH-202 carries a U.L. class "A" fire rating when applied to steel. CH-202 is most effective against radiant heat energy, typically neutralizing 78% of the Thermal Infra-Red (TIR) that would otherwise be absorbed by the substrate. A nominal 4 mil (100 micron) DFT layer is the equivalent of 4 inches (10 cm) of foam insulation against radiant heat gain. While operating as a radiant barrier, CH-202 will maintain a temperature within a few degrees of ambient, resulting in the potential temperature. INCA supplied CH-202 to the CSX Research Lab in Waycross, GA, for laboratory testing and a field trial of CH-202 in 'coil car' service. After nearly two years of evaluation, CSX came back to INCA with the positive results of their tests. These lab and field trials proved that CH-202 was thermally identical to the foam, but of course without any of the negatives of the foam application. CSX placed an order for a new build of 'coil cars' and INCA CH-202 was specified as the insulating layer. The car order was built over the following year and INCA went into 'official' status with CSX. Since that initial engagement, INCA has supplied Thin Film Thermal Management products to CSX for approximately 1,000 coil car units, built over several years. 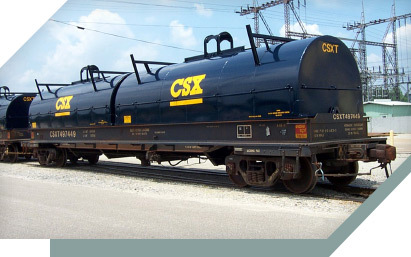 Building on the proven results garnered over the years, our strong working relationship with CSX continues to this day as we develop new uses on other rolling stock.